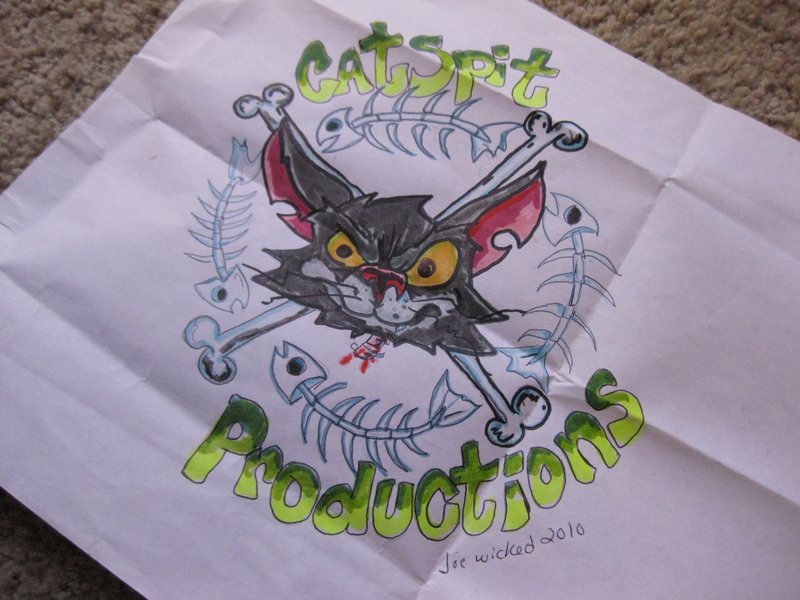 I have teamed up with Joe Wicked from YouTube to create an entirely new Catspit Productions logo. This is a very cool new logo that I will be calling the “Tom Cat” logo. I really love this concept that Joe did for me. I love the cat head as it reminds me of old Tom form Tom & Jerry. That was one of my favorite cartoons as a kid and I still watch them today whenever I have a chance. I received the raw artwork from Joe last week and I am in the process of scanning it. Then it has to be redrawn in the computer and made into vector artwork. This is a process which will make the hand drawn art digitized and able to be manipulated and color separated. Speaking of which, if you need to get some artwork converted into vector, visit the Artwork Services page of the Catspit website and check out the information there. I have added the service of vector art conversions to help out the many beginners in the screen printing industry. Artwork is the single most important phase of creating a screen print. If your artwork is poor then no matter how good you are at screen printing, the print is going to turn out badly. It is imperative to understand how to create artwork for screen printing but the first step in doing that is working with vector art and understanding how to create it. Since most of us are not professional graphic artists, including myself, having a service which can convert hand drawings and other scanned artwork into true vector art is a great help. I can use a low res JPEG, PNG, TIFF or any other digital graphic format readable by the PC to make vector art files in EPS format. I am excited to offer this new service and when the new Tom Cat logo is done I will post the vector image to show everyone the results of this service. You can go to the Artwork Services page and see a simple example of the conversion right now. Thanks a bunch Joe! I can’t wait until it is ready for printing. Thank you! Glad you like the artwork. Cats are pretty cool. I like the big ones too. Thanks for the comment!